By Alden Chodash: Perhaps before the 12th round of Srisaket Sor Rungvisai’s thrilling title defense against Juan Francisco Estrada concluded, boxing fans were thinking rematch. In this case, 12 rounds was not enough to determine who was the better man, despite the judges awarding Sor Rungvisai the majority decision win. More so, 12 rounds was not enough to fully satiate boxing fans around the world, many of which calling this fight an early candidate for “Fight of the Year”. With the rematch between Saul “Canelo” Alvarez and Gennady “GGG” Golovkin just months away, it’s interesting to look into how rematches typically trend; whether or not fighters who come on late tend to pick up where they left off, or whether one man ends up turning over a new leaf. Of course nothing is ever black or white in boxing, there’s a significant grey area in how rematches tend to trend throughout boxing history, but let’s look into a few notable examples in anticipation of some of boxing’s most eagerly awaited rematches. In their first battle, dubbed the (original) “Fight of the Century”, the former champion Ali enjoyed success when he was able to keep then champion Joe Frazier at range. However, Frazier used his Henry Armstrong-like perpetual bob-and-weave approach to pin Ali against the ropes for long stretches of time, punishing him to the head and body. Frazier punctuated a hard-fought victory in the 15th with a ferocious left hook which put Ali on his back for the 3rd time in the former champion’s career, and “Smokin’ Joe” walked away with a clear-cut unanimous decision. If any fighter had the momentum going into the rematch based on the way their first fight played out, it was Frazier, who punished Ali down the stretch with a brutal inside game that he executed by getting inside of Ali’s long jab and breaking free of his infamous holding. However, Frazier was also coming off a devastating 2nd round knockout loss to George Foreman, in which he hit the deck 6 times before referee Arthur Mercante waved it off. But Ali was not at the pinnacle of his game either; Ali was coming two close split decisions against Ken Norton, one of which he suffered his second pro defeat as well as a broken jaw. Come the rematch, there was significant bad blood between the two legends, but Ali managed his emotions more effectively and pulled out a unanimous decision in a close, but clear victory. The general pattern of the fight didn’t vary much from the first fight, with Ali moving cleverly and boxing at a distance and tying up a stalking Frazier up when they got in close. The main differences was that Ali was able to hurt Frazier in the 2nd round, and “Smokin’ Joe” didn’t have 15 rounds to break down Ali with a persistent attack. As demonstrated in their rubber match, the “Thrilla in Manila”, Ali and Frazier fights would always follow the same trend, regardless of how past their prime they were. Despite Ali’s clear advantages in size and boxing skill, the difference in each of their 3 bouts usually came down to will, one way or another. The Ali-Frazier example shows that not all rematches have to be unique from the original, as often two fighters are matched in a way that their bouts will always follow a similar pattern despite which stage in their career they’re in. One of the biggest disappointments in boxing history is that the first two wars Zale and Graziano pitched were not filmed, at least formally. However, when you rely on the likes of Nat Fleischer to recap their battles, it’s almost more exciting to read than watching half of Hector “Macho” Camacho’s fights put together (to be fair, during the second half of Camacho’s career). Interestingly, their first two wars followed a very similar trend. Graziano battered Zale through 5 before Zale came back to knock out the challenger in the 6th and in the rematch Zale battered Graziano until Graziano finally won the middleweight championship with a 6th round stoppage. In their second rematch, Zale left no doubts by knocking Graziano out in three rounds. The insight to be gained from analyzing this series of rematches is how each man suffered from the momentum of their prior encounter. Zale, who rallied to knock out Graziano in their first fight, came out too aggressively in their rematch and left himself open for Graziano’s counter attack, eventually losing his title in the 6th. Graziano, on the other hand, came out recklessly in their following rematch and lost the title via a 3rd round knockout. While neither fighter was a defensive specialist by any means, the Zale-Graziano trilogy shows how rematches can exploit the over-confidence of the previous victim, especially in the example of gunslinger vs. gunslinger. Fortunately for boxing fans, this trilogy was fully captured by the cameras and will likely be remembered for the remainder of boxing history. Most boxing experts predicted Gatti-Ward 1 would be a candidate for “Fight of the Year”, given that the two had already engaged in a combined 3 FOTYs prior. However, as HBO commentator Jim Lampley stated in the 9th, “We didn’t know it would be a candidate for fight of the century”. Micky Ward eked out a very close majority decision in their first battle, despite many believing Gatti did enough to earn the victory. Gatti, under the tutelage of new trainer and former champion James “Buddy” McGirt, was able to control the action when he applied his underutilized boxing skills, but was often drawn into a war when Ward was able to connect with hard rights and his patented left hook to the liver. Ward had Gatti all but out in the 9th with a left liver shot, perhaps making the difference in a give-and-take war. After the first fight, it was easy to see that Gatti did not have to make his rematch with Ward so difficult if he made a concerted effort to box on the outside. And while Ward had his moments in both of their rematches, Gatti largely controlled fights 2 and 3 by using his jab, footwork, and combinations to beat Ward at range, almost stopping him in the 3rd in fight 2. The Gatti-Ward example shows that often a loss will serve as a wake-up call to the losing end to put emotions aside and fight in a more conservative, proven approach to pull out rematches against technically lesser opposition. Tarver and Jones go way back to the Sunshine State Games as teenagers, when Roy Jones took the Florida state championship via a decision over the soon-to-be “Magic Man”. Perhaps Tarver’s animosity towards Jones stems from this very tournament, but regardless, Tarver made it clear as he was working his way up the light-heavyweight ranks that he was anxious to get in the ring with then pound-for-pound kingpin Roy Jones. Jones had dominated the light-heavyweight division for 5 years prior to moving up to heavyweight to easily dethrone John Ruiz, becoming the 2nd former middleweight champion to win a heavyweight championship in the process (after Bob Fitzsimmons). However, Tarver was ready to embark on his first defense of the light-heavyweight title Jones vacated in Jones’s first fight back at 175, and came out eager to make a statement by pounding Jones against the ropes for much of the early rounds. While Jones came back and dug deep to regain the title with a close, disputed majority decision, this only served to infuriate Tarver even further, who got a rematch 6 months later. “I have a question. You got any excuses tonight, Roy?” said Tarver during referee Jay Nady’s pre-fight instructions immediately prior to their rematch. Jones didn’t respond, and while Roy enjoyed pockets of success for the first round and a half of their rematch, Tarver flattened Jones with a vicious counter left in the 2nd round. Jones barely beat the count, and staggered when he got to his feet which prompted Nady to stop the fight, handing Jones his first decisive loss in his 51 fight career. While the momentum of the first fight favored Jones going into the rematch, who rallied well down the stretch to pull out a decision victory, the Jones-Tarver example goes to show how a rematch can serve as a dangerous medium of expression for the disgruntled loser of a close contest. Tarver carried clear animosity for Jones heading into their first fight, and by his perception of his title being robbed from him by the judges only served to further infuriate him going into their rematch. “You gave the wrong man a second chance” said Tarver during the build-up, and he was right. However, carrying so much emotion into a rematch does not always play into a fighter’s favor, as can be seen by the next example. 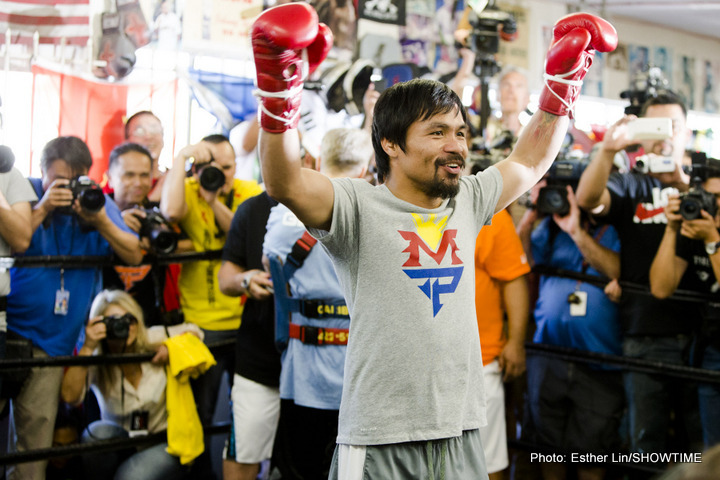 En route to his long-awaited mega-fight against Floyd Mayweather, Manny Pacquiao would make his 4th defense of the WBO welterweight title against undefeated former 140 pound champion, Tim Bradley. Bradley was considered a dangerous challenger heading into the fight, considering his youth, determination, and eagerness to capitalize on the biggest opportunity of his young career. Pacquiao, on the other hand, appeared to be in a hurry to cash out against Mayweather, as his previous struggle to edge Juan Manuel Marquez suggested that Manny was becoming increasingly vulnerable at this stage in his career. While Pacquiao was not the whirling dervish he once was against the likes of Cotto and De La Hoya, he impressed many boxing fans by his ability to control Bradley with his timing, inside game, and intermittent fury. Bradley remained game throughout the fight, and may have done enough to steal a few of the late rounds, but very few thought he won more than 4 rounds in the fight. That was, until the judges read their infamous scorecards. Tim Bradley had somehow escaped with a dubious split decision over Manny Pacquiao, handing the Filipino superstar his first loss since Erik Morales bested him in 2005. However, the public uproar was so impactful on Bradley that the “Desert Storm” even claimed he and his family had received death threats following his upset victory. When the two met again 2 years later, Bradley appeared to have just as much to prove as Pacquiao, if not more. Bradley, not a big puncher to begin with, uncharacteristically over-relied on scoring a knockout over Pacquiao instead of using his boxing skills to gain a tactical advantage. After four competitive rounds, Pacquiao began to run away with the fight with his activity and combination punching, dominating the second half of the fight en route to a majority decision victory that, for all intensive purposes, should have (once again) been unanimous. Unlike Tarver against Jones, the disgruntled Bradley, who felt increasingly obliged to prove himself in the midst of their first fight, fell victim to his emotions as Pacquiao exploited his questionable game plan in their rematch. If Sor-Rungvisai-Estrada 2 (if materialized) and Canelo-GGG 2 play out similarly to Gatti-Ward 2, in which the technically superior fighter was edged in their first fight (although Canelo-GGG was technically a draw) by falling victim to the will of their opponent, you can expect Estrada and Canelo to carry out a more concerted effort to control the fight with their superior boxing skills and pick up where they left off in terms of the technical advantages they enjoy. However, Sor Rungvisai and GGG may come out feeling as though they have something to prove to their loyal fans who missed the killer instinct they showed during their most impressive knockouts, and may follow in Tarver’s footsteps by increasing the intensity of their attack in the rematch. Either way, boxing is so unique in the sense that history doesn’t always repeat itself, especially at the highest level of the sport where fighters are so apt to make adjustment both between and during fights. Only time will tell how these long awaited rematches play out.